My notebook still uses Windows ME, so I can’t even get software help anymore. My Acer Aspire is too small and too slow for a “portable” laptop! Being retired and on disability makes it hard to afford new technology! I’ve never had a laptop, love to have this one. My current laptop is so slow. I tried upgrading with a cheaper laptop and its just not cutting it. I do a lot of sweeps, internet searches, twitter, facebook with many many tabs. It just locks up all the time. As a matter of fact it took me 5 minutes just to write this short paragraph! Would love to win, thanks! I would REALLY like to have a laptop. My friends keep saying they are hearing good things about the Lenov’s and I would like to get one and then tell THEM just how cool it is!!!! Please help me be ‘up one’ on my friends for once. I need an Ultrabook for our homeschool assignments, record keeping and social networking. Cool. I don’t really like my current laptop and this one looks slick! What a wonderful thing for the business. Can travel with me everywhere. I’m old so gadgets need to be light and easy for me as well as inversely young. This is the perfect thing for my wife. She has been asking for one for a while. She nnnnnneeeeeeeeddddss one badly. I work on my computer everyday and do some traveling. The “Leno” would find itself in constant service if placed in my hands, but I see so many others that are more deserving. I just pray that whomever needs this most will get it. Thanks for the offering and opportunity. I travel frequently and my lap top is so old, big and heavy that a new Lenovo would save my back! I could really use a new laptop. I bought one a lap top a little over a year ago and should have gone for more memory etc. At the time I thought it was going to be enough. I need a new one to replace my ooooooold one! I am a homemaker. No one in my family think I ever needed one. Now I travel and have to beg/borrow others just to keep up with my online accounts and with identity safeguards becomes a problem accessing accounts from different computers. Can’t afford to buy one myself. I really need this laptop because of my situation. I have been in bed since 2010 due to a car accident which gave me CPS.What that means is that I live in constant PAIN in both legs, sitting or walking makes it worse, so I have to stay in bed all day. Having a laptop will let me be involved with the living, the internet, friends, news, chat lines and people who have the same problem as me. You know the old saying “Misery loves Company!” So I really hope I win this. I would Love to win the Lenovo Ultrabook! This looks great and would be such an upgrade from the one I am using now. Thanks! I want to play all the new games which require a very powerful laptop. Thanks. I honestly need to win because I’m totally disabled w/o anyone to help in any way - I wouldn’t ever be able to afford to buy one since I don’t have the “luxury” of being able to work, let alone get any additional “work” to support my greed! All I have is a smartphone-I’m without any access to a regular computer. A computer is the only way that I could even possibly improve my life! Thank you for this opportunity of hope-sincerely, Randy. I want to play all the latest games which require this exact super powerful laptop. Thanks. My 6 years old Thinkpad is so old it has an IBM (not Lenovo) logo and I have to run a non supported version (jaunty)of Ubuntu Linux to get ANY use from it at all. I need a new Intel-powered Ultrabook because the laptop I have right now is old and slow. The Ultrabook is fast,sleek,and lightweight next to my laptop. Fingers crossed! Thanks for running this contest. Because I took the time to notice that Lenovo backwards is OVONEL. Oh the reasons…. I have never had a laptop before… the possibilities abound. I also have a teenage son who will be heading off to college in another who is currently w/o a computer…. And a 6 year old who desperately wants one… And, I would love to be able to have my desktop to myself instead of sharing with them. I would like a laptop to be more updated in the computer world. I like to browse on facebook and interesting internet sites. I love news. I would like to be able to keep up with current events as much as possible. I am using my wife’s OLD Gateway (still has XP on it)since she got a new one last year. This Gateway is so slow it’s very frustrating! To own a laptop….that would be wonderful. This would be a great win, I have wanted a laptop for quite a while just haven’t been able to budget for one yet, this would really make my year. I don’t have a laptop and would love to add one to my collection of electronics. I am a new PhD student buried under all these writing projects! I would love to have a laptop to take to school to help me keep up. I want to take a computer with me whereever I go! I have been unemployed for 2 1/2 years. If I had this I would be able to broaden my possibilities for work. We only have the one computer, a desktop, at home and it is really used a lot and is very slow. It would be such a blessing to win this compuiter. I would love to not share my computer and to get to my email and info when I need it without making someone cry when they get kicked off of webkinz! The reason I want to win Lenovo Ultrabook? I’m still using a desktop that is now 10 years old ( slow ) and XP Windows. Support expires in 2014. Forget about Windows 7 I couldn’t even upgrade to Vista being on XP :( I’m disabled and my only connection to the outside other than my closest family members is online. Once my PC goes that’s it! I don’t even have the cents much less dollars to buy a new one so to win is my only hope. Also it would be nice to have the option to be able to use a computer in a more comfortable way than only at my desk. It would be nice for once to be up to speed with technology than in the dark ages as I feel I am now. I need a new Lenovo because I have one that is about 3years old. I love it but my son needs one and I would give the one I already have to him and keep the new one for myself. for my grandson, who is the only computer-less person in his nuclear family, poor guy. I’d love to win a laptop for myself…I’ve never owned one before! I share my PC with my kids. I would love to have one just for myself. I need a new laptop to continue with my RN nursing studies. My old laptop is about ready to bite the dust so this new Lenovo would be fantastic. I love Solid state computers because if you drop it…you don’t have to worry about breaking your fragile hard drive!! My old laptop suddenly freezes up. You have to take the battery out and then out it back in to shut down and restart. Cooling pads don’t help! I need a new Ultrabook! I have the most raggedy computer in all the land. More so than anyone that has responded above me. I need a new laptop cause my ex is taking this laptop back even though he did get it for me! Oh well this laptop is behind the times anyway.Out with old and in with the new! 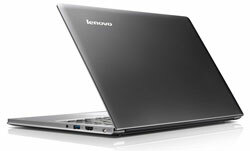 I would love this Levano Ultrabook, I would give it as gift to my husband, he does all his bills etc. on line but his laptop is old and very slow, I can’t afford to buy him a new. This would be awesome! !